GRIN promotes your eBook and book with a great number of marketing activities. For example, we publish your papers at Google Play, Google Scholar, Amazon and thousands of book stores and online shops. On top of that you yourself can do a lot for the success of your publications. You know your subjects best and can market your papers with your specific knowledge to reach more buyers. Especially many links to your documents and good reviews can lead to success in sales. Below you find the most promising methods. Facebook is the world’s largest social network. Click the “Share”-button on your eBooks at GRIN.com and show your publications to your friends. This can increase the search engine ranking of your texts and even more people get to see your works. The same applies for the “Twitter”-button. Twitter is a service to make your personal news public. You can type short messages and tell others about your texts. As you can only use 140 characters per message, use our link shortener for having more space for your message: grin.to. This service shortens long links and forwards all users to the specified website. Tell others about your eBooks on social networking websites like LinkedIn. 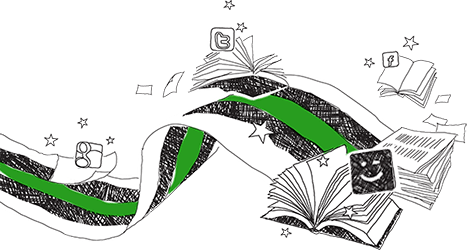 On your personal page you can write something about your books – so your colleagues, friends and other users come to know your publications. Refer to your eBooks on specialist portals or forums. There are many specialist websites with large numbers of users, on which you can present your publications. During research for your text you probably already came across several websites addressing your topic, just contact them! Submit your eBook to social bookmarking websites: By that you can gain new visitors and attention in seconds and even improve your search engine ranking. Social bookmarking sites are just like your browser favorites – but publicly available. You can tag your favorites with fitting keywords and other users can find and use them. Do you have a blog or a homepage? Then tell others about your publications and link to the previews at GRIN.com. With services like www.jimdo.com you can easily create your own homepage and present your publications. Use your partner link and earn additional 5 % for every sale. Find the link here. Blogs are like a public diary or notebook. If you don’t have an own blog you can start one at www.blogger.com or www.wordpress.com. Blogs are read by a large public. So the message of your book can spread swiftly! Ask friends and family to share the link to your book or to draw attention to it through the already mentioned social media platforms. They can also write honest online reviews. Good reviews by enthusiastic readers can increase the sales of your eBooks and paperbacks considerably. Make use of your author’s copies at a reduced price and send them to fitting professional journals or websites to get your book reviewed there. Good press reviews can boost your sales too. Order your own books here. Upload your photo to GRIN! A photo of the author of an eBook or book increases the sales of the product. You can easily upload your photo here. You can add a biography too. Share the GRIN and Amazon links to your book in your e-mail signature. Use free press services to publish press releases about your book or eBook. This can increase your sales and attract attention for your books. Just search Google for free press services and get started! Are you acquainted with specialist book stores or shops that would be interested in your books? Call them and see if they want to sell your publication! Try to organize readings of your books together with book stores, companies or organizations. At a reading you can introduce your writings to an interested audience and sell copies of your own book directly. Only the best for your book. Whether expressive cover or marketing jump-start – we make it possible. Do you have any friends who have written academic papers? Invite them to upload their documents to GRIN. For each new author whose papers we publish, you get 5.- €! Click here to invite your friends easily and quickly. Download our terms & conditions for affiliate programs here. Your provisions are transferred to you with our quarterly statement. Do you have a homepage or a blog? Then link to GRIN and earn money with every sale you generate. With your partner link which you get here you can start immediately. You get 5 % of every sale (from the net sale price). Download our terms & conditions for affiliate programs here. On top, you receive 5.- € for each new publishing author who registers after clicking your link! Become a GRIN ambassador – earn money! Become a GRIN ambassador! We’re looking for sociable and networked students who spread the word of our services. You get special flyers and posters with your personal ambassador code and an individual link to post on blogs or social networks. Interested? Contact us via botschafter@grin.com.